I get so many good questions from you guys, it's not even funny. You: "Lise, are you going to make some of the formulas in your shea butter book available as separate products so we could maybe try out a formula or 2?" Me: "How clever an idea is that? You rock for asking me! Of course I will!" 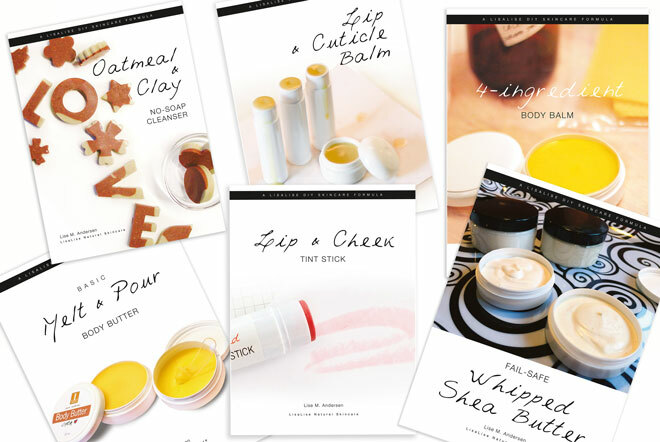 So, six formulas from the book Working with Shea Butter have been carefully selected and lovingly packaged into single-formula-booklets with a little intro, information on what equipment you need to get started – and of course, the formula with step by step instructions. The solo formula booklets cost $5 each. But don't buy all six. Buying all six would cost $30. And for a mere $5 more, you get the whole book which has 14 formulas plus chapters on heating and cooling methods, troubleshooting, tips, how to work with the (heavy-ish) scent of unrefined shea, and more cool shea butter stuff. You can check out all six solo formulas right here. And thank you for your always inspirational questions!